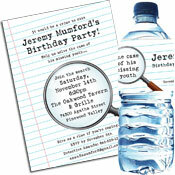 A murder mystery party (for those who don't know) is an interactive dinner party where 6 or more guests get together, each playing a specific character, who all work together to solve a murder. The aim of the game is to guess correctly which character is the murderer, and to have as much fun as possible doing it! Each guests gets a character outline that tells them their relationship with the deceased, their feelings and relationships toward the other characters, and their overall personality. There are customized actions for the characters, and throughout the night clues are revealed, alibis uncovered, and reactions between guests analyzed. At the end of the night, everyone considers the evidence and takes a guess at the murderer. Then the culprit reveals themselves and explains how they did it! Put some thought into your guest list. Make sure you invite people who will enjoy this type of event and really get into it. Assign the more outgoing characters to the least shy of your guests, and the less involved parts to the more timid people in the group. As the host of the party it is your job to keep the script going. Don't let the group get sidetracked with conversation about the last episode of such and such or "did you see what that coworker yada yada". Keep the ball rolling and encourage guests to stay in character. Encourage guests to come in costume. Let your guest know ahead of time who their character is so they can prepare. Do a buffet instead of a sit down meal. It will let you focus on the guests and the mystery at hand. Listed below are some great free murder mystery scripts! 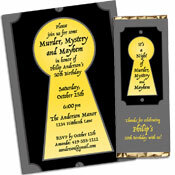 Murder Mystery Party for Kids (up to 36 players) A wonderful and age appropriate game for kids. Casino Theme Murder Mystery (5-17 players) - This Murder Mystery allows party guests create their own character’s backstory. The Business of Murder (7 players) This murder mystery has a backdrop of academia. The Little Engine That could Kill (8 players) On Wednesday, August 5 th , 1932, you and eight other passengers boarded a three-day express train from Bombay, India to Lisbon, Portugal. Unfortunately, one did not survive the journey. The Romanian Uranium Mystery (6 players) - Follow Inspector Clueles and INTERPOO in solving the greatest scams of all time. The Pungent Pumpkin Poisoner (8-10 players) "The Pungent Pumpkin Processing Company" is celebrating its first anniversary. Founders, Friends and Associates have gathered together in a luxury restaurant to toast the company's success and to mark the launch of the company's two latest products. But one member of the company is about to find out that "Pungent Pumpkin Rat Poison" is lethal!